These slow cooker hot cross bun cinnamon rolls are perfect for a super delicious, no fuss, set-it-and-forget it Easter brunch recipe. 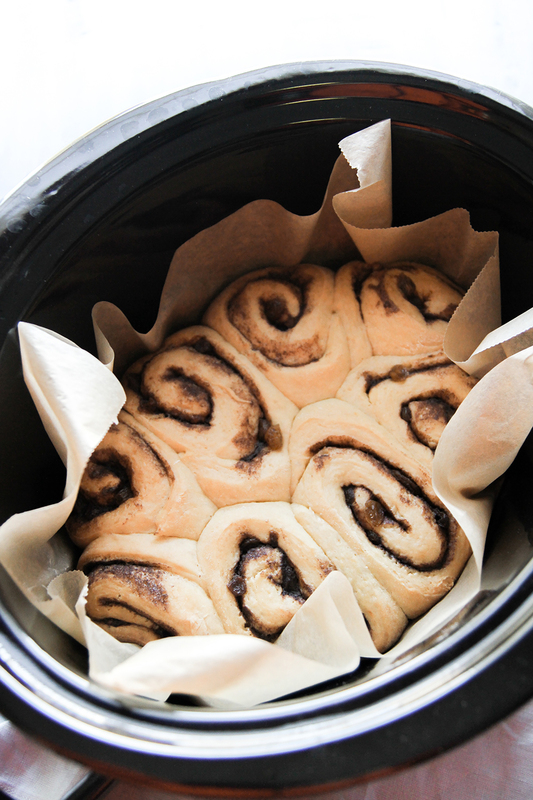 The most amazing thing about these incredible slow cooker cinnamon rolls is that the dough is super easy to make and there is no long rising time, because the slow heat from your slow cooker does all the work for you! Next add in the melted butter and stir, and then add in the flour, baking powder and baking soda. Stir until the dough comes together. It will be a slightly wet and sticky dough. Form dough into a ball and put it on a floured board or surface. Cover with a towel while making the Filling. Make the Filling: Mix all ingredients together and stir until combined. Gently roll out into a rectangle shape (12-14 inches long by 8 inches wide). Cut the dough into 8 pieces (a pizza cutter works great for this.) Line your slow cooker with parchment paper and spray it with cooking spray. Gently place formed rolls in the bottom of your slow cooker, leaving a little space in between them. Make the frosting by stirring all the ingredients in a bowl and pour it over the warm rolls - OR - pipe a cross on each roll (add additional powdered sugar or less milk to get desired consistency) for the ‘Hot Cross Bun’. Gently break the cinnamon rolls apart and serve warm! *Melt the butter in the microwave and set aside before starting to make the dough.